When Littlehampton based engineering firm IEC first enquired about the possibility of Hampshire Mezzanine Floors designing a new mezzanine floor that could support a 2 Tonne lifting hoist, as well as storage capcity on the floor, our designers were initially sceptical. However, once we established the position of the lifting beam and the weights involved and the overall design of the mezzanine floor was factored in, Hampshire Mezzanine Floors were able to design a structure that was both capable and economic. 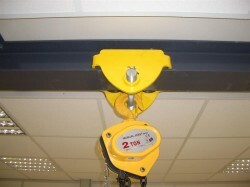 The hoist is supported by a crane beam suspended under the mezzanine floor steels. The lifting hoist can run along the crane beam and support the 2 Tonne engine during testing trials. Additional smaller lifting beams were also added to enable support in two directions and increase the flexibility of the structure and remove the need for independent lifting equipment and ensure the engine is safely supported at all times. This special type of mezzanine structure now provides IEC with a large storage platform capable of supporting heavy loads with access via a goods lift as well as the framework for the hoist and beam. 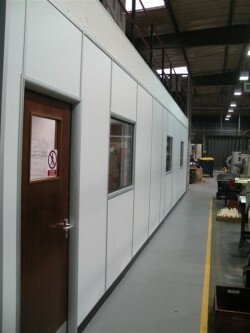 A sound proof testing room was also installed by Hampshire Mezzanine Floors to provide suitable testing laboratory environment. This new mezzanine floor and new Part K staircase also provided safe access to an existing mezzanine floor in the next building. Hampshire Mezzanine Floors have always provided cost effective solutions in the work, storage and office environments, but they can also provide a supporting structure for hoists and cranes, often improving health and safety within the workplace. Hampshrie Mezzanine Floors provided a ‘one stop shop’ approach to the project and satisfied the clients various requirements including Building Regulation and Landlord approval. 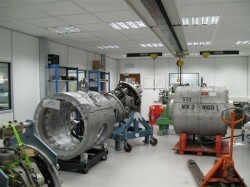 The project was installed during normal working hours with minimum disruption to the production facilities.